Well folks, that’s the Mod over for another year. What a fantastic week it was! A big thank you to each and every one of you for making it what it was. Both our offices are closed this week so we will be open for business as usual next Monday. We hope you all had a great week. See you in Inverness next year! ​Good luck to all the choirs who will be competing tomorrow! No doubt you will all have had a busy day with practices… we look forward to seeing you all tomorrow! ​Attention all choir members, singers and instrumentalists / bands! If you are about tomorrow or Friday, pop over to the Piazza Shopping Centre in Paisley, where we have the Mod Showcase. We have an open stage there so it would be great to get some entertainment for all the shoppers! 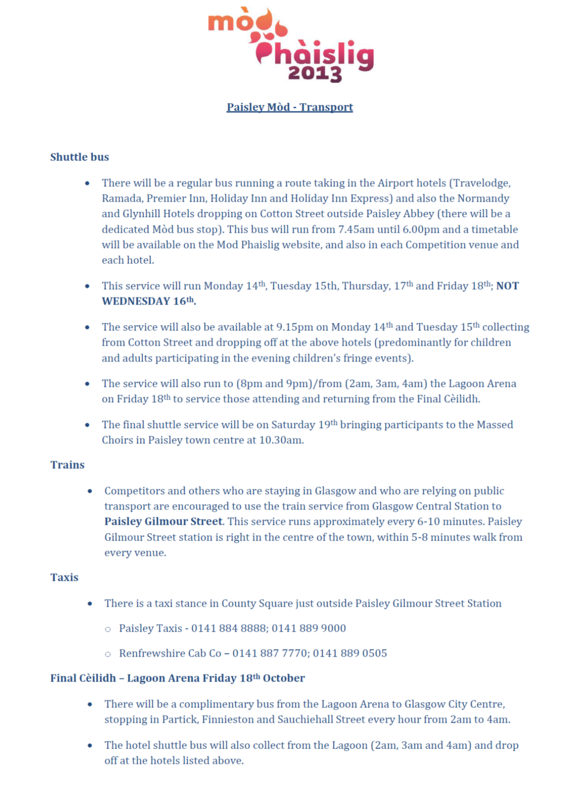 Adjudication sheets from Saturday’s competitions and today’s competitions are available in Paisley Town Hall. This will be open between 9-5 each day. But don’t worry if you can’t come along to collect them, we can always post them out to you after the Mod. For information on tickets, concerts and so on - please contact the Mod Information Desk in Paisley Town Hall on 0141 618 5758. For withdrawals and information on competitions and competitors, contact the Mod office on 0141 618 5949. The Mod Programme is now available to buy in our offices in Inverness and Stornoway and from the Gaelic Books Council in Glasgow. To order a copy, please contact 01851 703 487. ​Would all media intending on visiting this year’s Mod in Paisley please register their details on our website to receive a press pass, access to the press office and press conferences, and regular updates on daily activity at this year’s Mod?